Once again, we would like to thank KEY Milwaukee Magazine for using a few of our images in their new new electronic newsletter "Key-Zine". 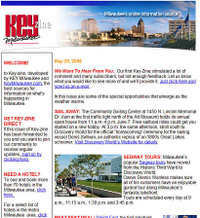 It is filled with information about travel and upcoming events in the Milwaukee area. Great for both tourists and residents alike. Discounts and travel packages to many Milwaukee venues are also offered. It is a must e-mail to recieve for anyone interested in the Milwaukee scene. Click here to subscribe.